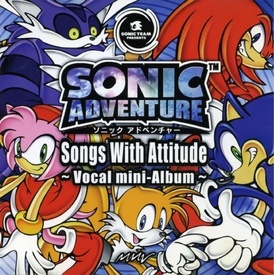 Sonic Adventure Songs With Attitude ~Vocal mini-Album~ is the first of three soundtracks released to coincide with Sonic Team's first foray onto the Sega Dreamcast, Sonic Adventure. Available before the game's release, the album contains the many vocal themes that would come to define the sound of Adventure. This page was last edited on 31 December 2018, at 23:30.